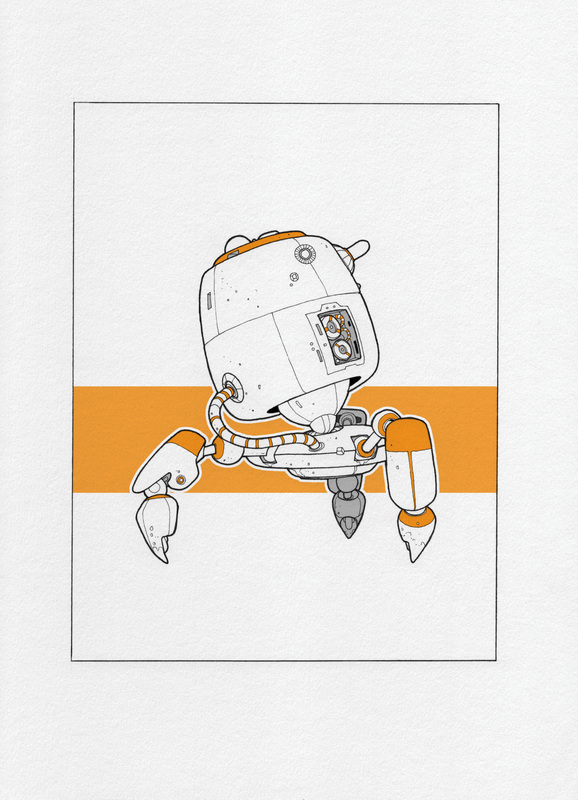 If you’ve been following my blog for a while, or following me on Twitter, Tumblr or Instagram, you’ll know that between August 2013 and August 2014, I drew a robot a day for a whole year. It was quite daunting committing to a daily project of that length, but it was something I felt I had to do to get me in to the routine of drawing every day – a skill or habit that I’d need if I wanted to become an illustrator for a living. I think it achieved its purpose – I now get pretty restless if I don’t draw at all for a day, and I’m currently work on my first book illustration project. 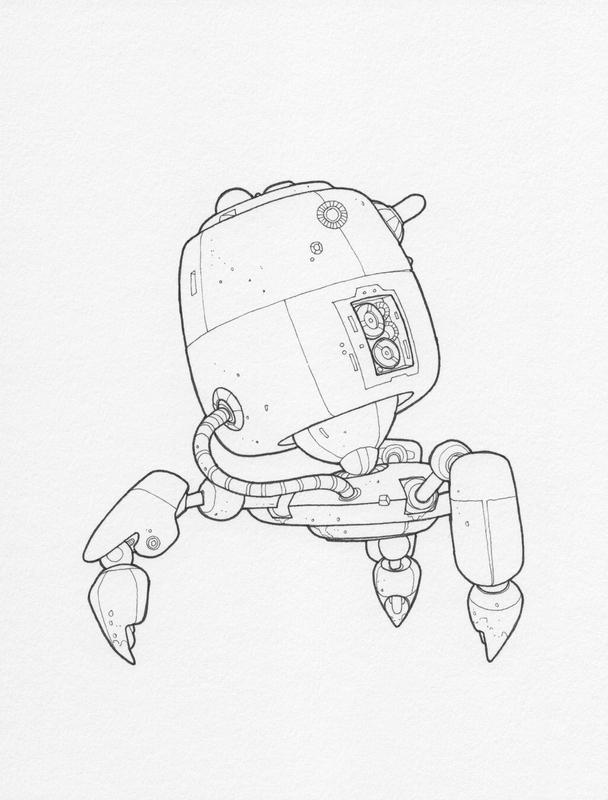 I haven’t really drawn robots since I finished the Droid a Day adventure though, and to be honest, I’ve missed them. 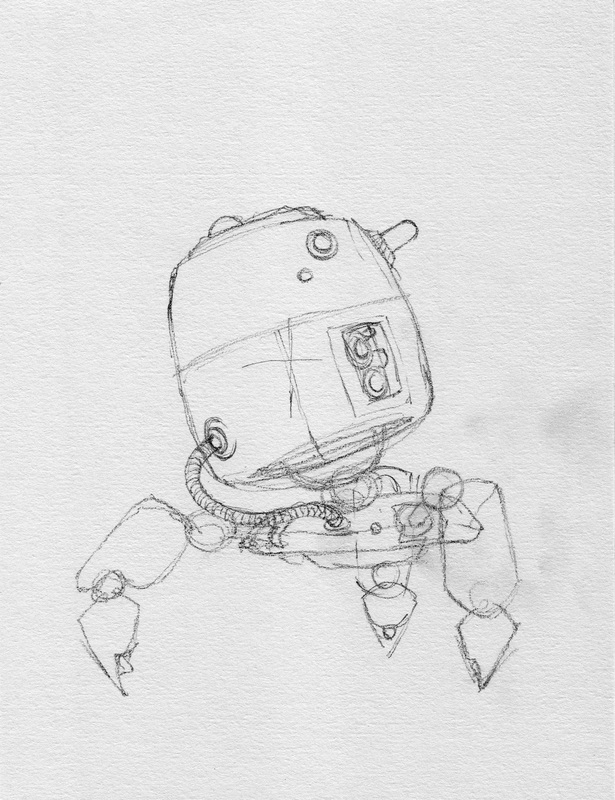 Today I’ve given myself the day off from paying work to rustle up another droid, and I’m pretty pleased with the way he came out. That’s adorable, and I love seeing the transition from sketch to final product. In wondering about how you process your work – the final version is so clean. Do you use a vector based program, or photo editing software? Excellent…..beautiful line work, you have a very steady hand Mr Turpin! Thanks fella. I actually think my line work has improved a bit over the last few weeks. I am doing a lot of drawing at the moment so perhaps it’s just the practice. Hi, thanks for the lovely comments. All my work is hand drawn. I usually thumbnail little sketches while I’m working on something else, and then if there’s something I like I’ll come back to it and sketch it out bigger. I then ink using either Staedtler Pigment Liners or Copic Multiliners. I’ll then scan and do a little tidying up – usually just getting rid of any specks of dust, and I might tweak the contrast a little. I didn’t actually notice that as I drew it!